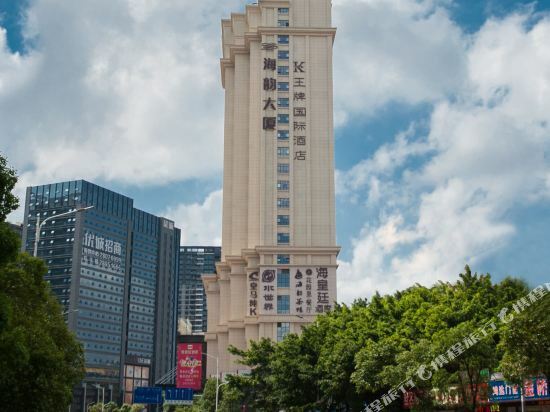 The Grand Skylight Garden Hotel (Huayuan Gelan Yuntian Dajiudian) is located opposite Futian Central Park, close to the Shenzhen Metro. Rooms in this Shenzhen hotel are equipped with broadband internet access, LCD TVs and mini-bars and all-day room service is available. A Grand Ballroom capable of accomodating up to 500 guests, and four conference rooms are located within the hotel. Inhouse dining options include restaurants serving both Cantonese and international cuisine, as well as a café and bar. Recreational facilities include a fitness center and a mini-golf driving range. 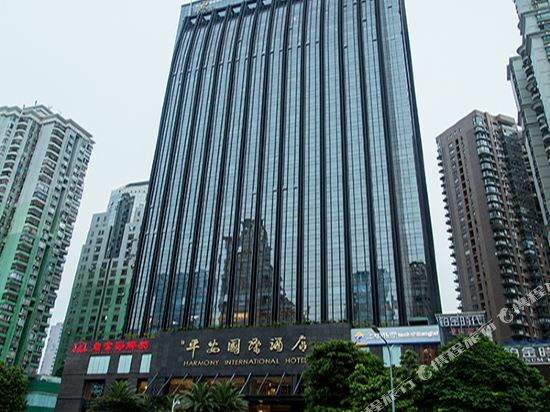 The European-style Best Western Felicity Hotel (Shenzhen Fulin Dajiudian) is located in the heart of the city, near the banks of the Shenzhen River looking across the border to Hong Kong. The hotel provides high standards of service and a full range of modern facilities. Guestrooms here are comfortable and some offer views of the river. Dining outlets in this Shenzhen hotel feature menus showcasing cuisines from China, Japan and Europe. There is also a delicatessen and pool-side snack bar within the hotel. The hotel has its own well-equipped fitness club and professional fitness coaches are on hand to help guests train. There is also a spacious conference and banquet hall, six other function rooms and seven private rooms, all equipped with the latest facilities. Other amenities include a business center, conference rooms, shopping arcade and a swimming pool. 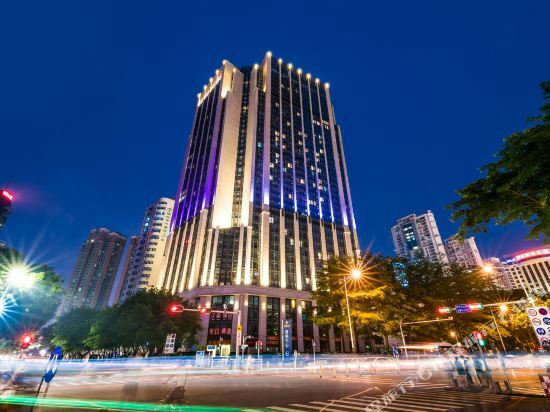 The Sunshine Hotel (Shenzhen Yangguang Jiudian) is one of Shenzhen's leading 5-star hotels, conveniently located near Dongmen Pedestrian Street in the heart of the city's business and financial district. 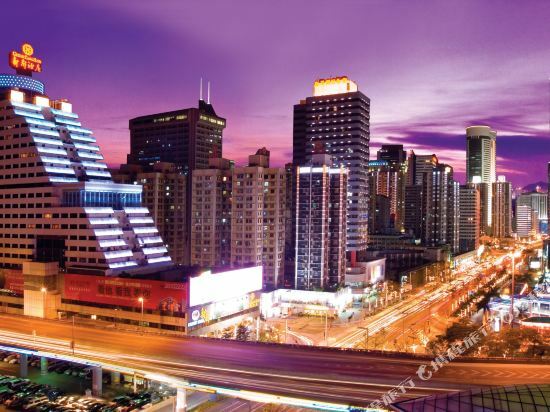 The Sunshine's proximity to the Lowu (Luohu) Border Crossing, train station and Shenzhen Metro make it well placed for travelers on the go and particularly those heading to Hong Kong for business or leisure. <br><br>All of the Sunshine's 379 guestrooms and suites are well furnished and include broadband Internet access, in-room safes, satellite TVs and other amenities.<br><br>The Sunshine Hotel has a newly refurbished Imperial Wing offering 64 modern executive guest rooms and suites equipped with flat screen TVs, DVD/CD players, luxury bathrooms, brand-named bath amenities, over-sized work desks with built-in sockets for computer users and in-drawer business kits.<br><br>Chinese and Western cuisines are available on-site along with room service.<br><br>A range of recreational activities are on offer including a disco, karaoke, an indoor pool, virtual golf, massage, sauna and fitness facilities. 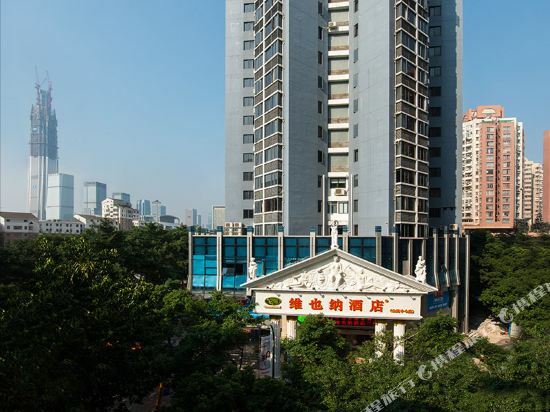 The Yitel Shenzhen Huaqiangbei (Huaqiangbei Heyi Jiudian) is located in central Shenzhen within easy reach of Line 1 Huaqiang Road Metro Station. Shenzhen Bao'an International Airport is approximately 35 km (22 mi) away. This Shenzhen hotel provides Wi-Fi access in public areas and parking on site. 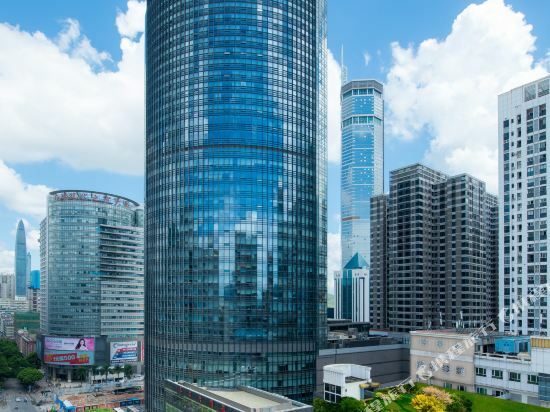 Located at Huaqiang North Business Center, a 36-floor building in the most prosperous area of Futian District, Shenzhen, Huaqiang Plaza Hotel is a high-end business hotel, invested, built and run by Shenzhen Huaqiang Holdings Limited. Each of the 266 guest rooms has an area of 45 square meters or more, spacious and comfortable, with a wide view; standing in front of the French window and looking at the distance, you can have a panoramic view of the prosperity of the city. 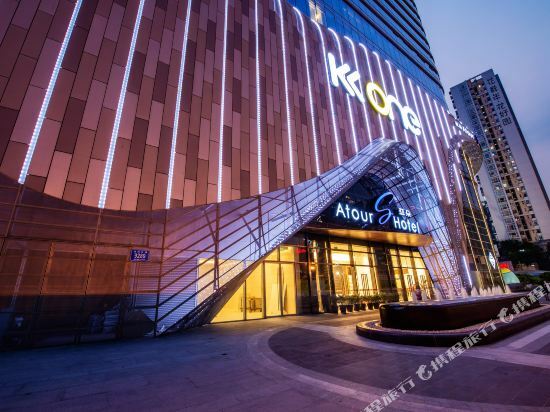 Here you can find Chinese and Western restaurants and lobby bar with elegant environment, fitness centers, conference rooms and other facilities, as well as the free high-speed wireless network available at public areas and guest rooms, making it a typical high-end business hotel. 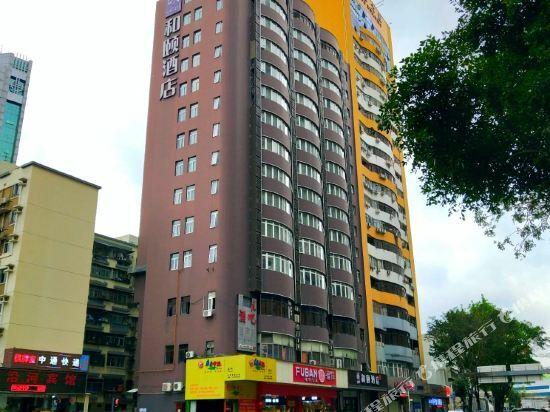 The Hotel stands right across from Huaqiang North Electronic Market, the biggest specialized electronic market in China and is close to Huaqiang Metro Station of Metro Line 1, 2, 3 and 7. There are 3 underground floors, with 1500 parking spaces. 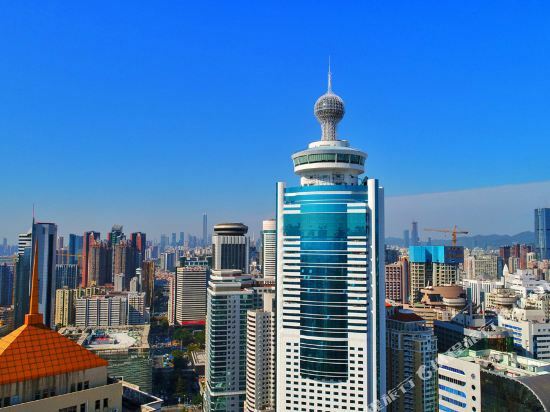 It is only 10-minute drive from the Hotel to Shenzhen Convention & Exhibition Center, Futian Port, Luohu Port and Luohu Railway Station; about 20-minute drive to Shenzhen North Railway Station, 25-minute to Shenzhen Bay Port and Shenzhen Hi-Tech Park, and only 35-minute to Shenzhen Airport. 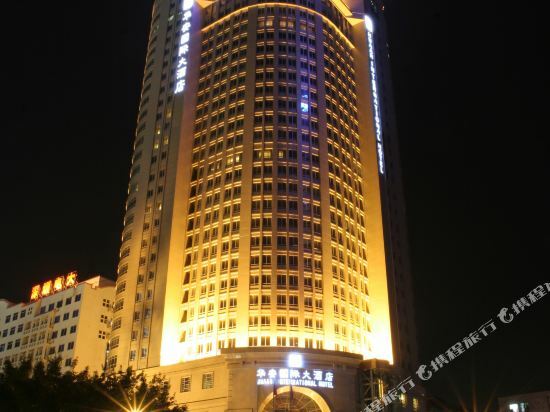 Take a walk from the hotel, you can visit Huaqiang Electronic World, 9 Square, Century Place, MIXC and some famous restaurants and bars, which makes it a first choice for business trip, recreation, shopping and conferences. 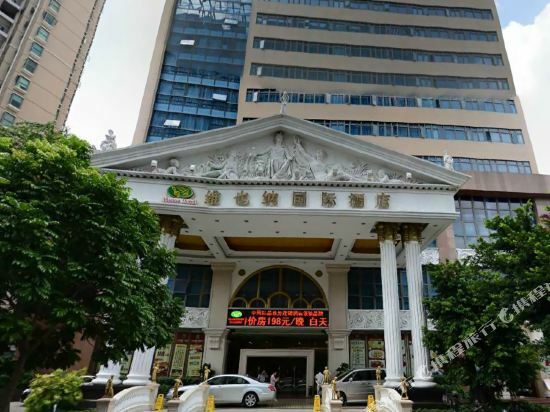 The Vienna International Hotel (Weiyenan Guoji Jiudian Shenzhen Dajuyuandian) is located in Shenzhen's commercial area, within easy walking distance of a metro station, Shenzhen Grand Theater, Diwang Mansion, Shenzhen Bookstore, the Statue of Dengxiaoping and Lichi Park. 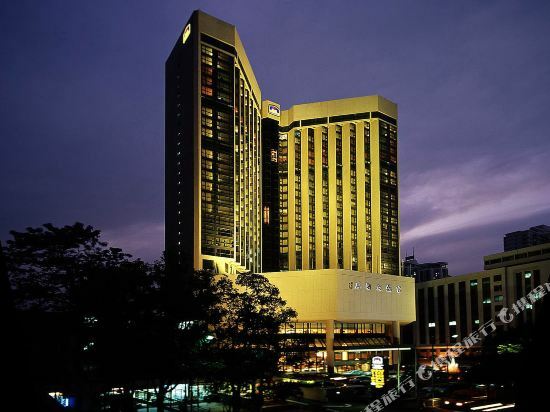 This Shenzhen hotel is only five minutes' drive from the Shenzhen Railway Station and 40 minutes from Shenzhen airport. 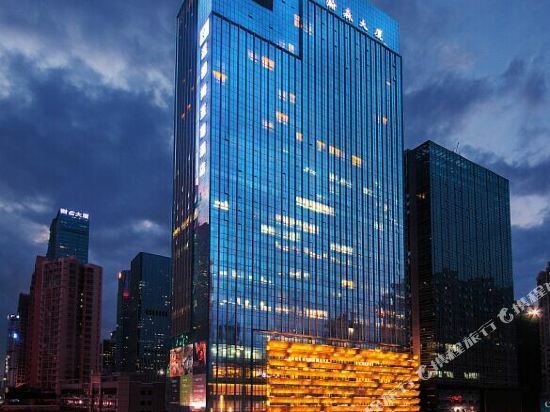 Formerly the Hilton Shenzhen, the Panglin Hotel (Shenzhen Pengnian Jiudian) is a 5-star hotel located in the heart of Shenzhen's Lowu commercial district, about 60 km (37 mi) from Shenzhen's Huangtian International Airport and 3 km (1.8 mi) from both of Shenzhen's railway stations and the Lowu customs area. Among the Panglin Hotel's selling points are its Sky Lounge and Revolving Restaurant, both of which boast excellent Shenzhen city views. Guests may choose from seven differernt dining outlets, including Sky Paradise on 50th floor, the highest revolving restaurant in Shenzhen. The Togetsukyo serves Japanese cuisine and Apollo 57 on the 57th floor is a popular spot to unwind with a drink and take in stellar views of the metropolis below. The Panglin features 527 standard rooms and suites, all featuring individually-controlled air conditioning, in-room safes, Internet and fax ports, satellite TVs with HBO, CNN, ESPN, NHK and various Southeast Asian channels, direct international and domestic-dial phones, minibars and refrigerators. For Dynasty Club members, there are two luxury presidential suites. Rooms are also available for disabled guests and non-smokers. Also available for weddings or events are a ballroom with a capacity of up to 600 attendees and three function rooms: Laurel, Camellia, Lotus which can open up into one, state of the art audio visual facility with a simultaneous interpretation system that will satisfy guests' every need. A business center is available for those in need of professional services. Guests in this Shenzhen hotel can pamper themselves in the Littoral Health Centre which has separate sections for VIP and Ladies. Guests can use the sauna, massage, solarium and gym. One of the best feautures is the outdoor rooftop swimming pool with poolside bar which allow guests hours of relaxation in the summer sunshine. 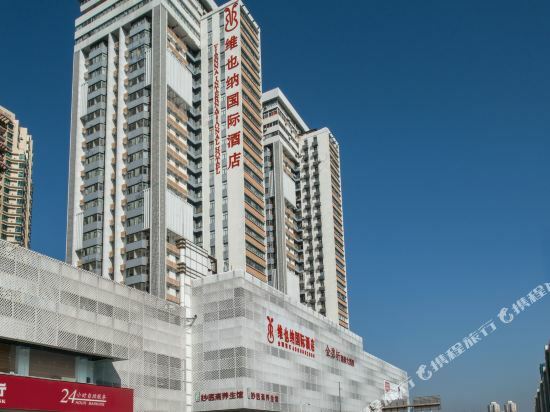 The Asta Hotel (Huangxuan Jiudian) is a short walk from Huanggang Port and the Convention and Exhibition Center.<br><br>This Shenzhen hotel features rooms with free Internet, rain showers, satellite TVs and IDD phones. Some rooms have connecting rooms and the hotel also has a non-smoking floor.<br><br>A business center, a range of function rooms and a grand banquet hall suitable for meetings and events are located within the hotel.<br><br>A comprehensive range of dining options are available including restaurants serving Cantonese, Southeast Asian and French cuisines. The hotels also features a lobby lounge and room service is available. 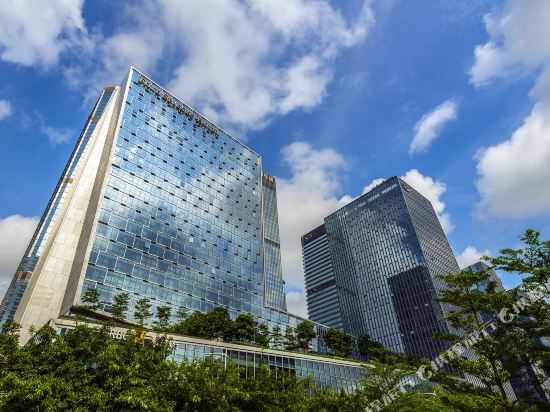 The Wyndham Grand Shenzhen (Shenzhen Wendemu Zhizun Jiudian) is located within easy reach of Gangxia Metro Station and Shenzhen Convention & Exhibition Center. Shenzhen Bao'an International Airport is a 30 minute drive away, while Hong Kong International Airport can be reached in 60 minutes by car. Dining options include a Western restaurant and Chinese restaurant which serves Cantonese and local cuisine. Business guests are invited to make use of the meeting rooms to conduct their affairs. 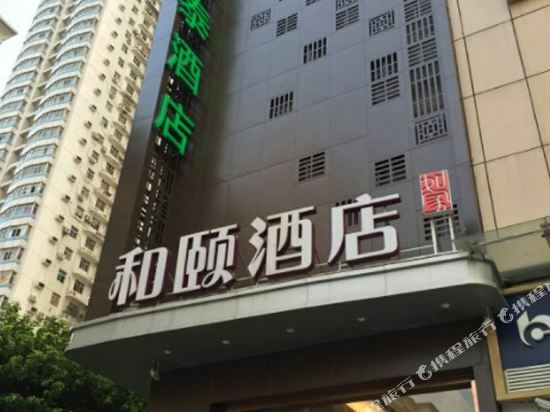 This Shenzhen hotel has free Wi-Fi in public areas and free parking. In their spare time, guests can take a dip in the indoor swimming pool, workout in the gym, or enjoy a drink at the lobby bar. 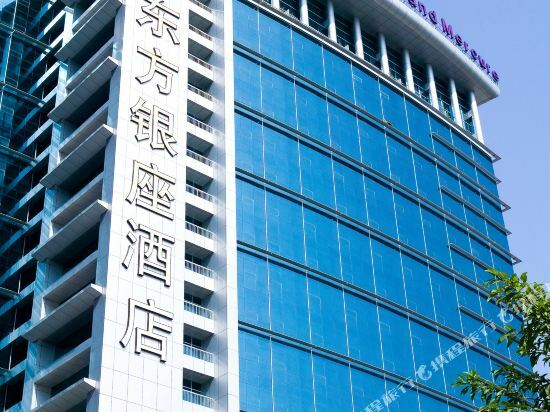 The Harmony International Hotel (Ping’an Guoji Jiudian) (Shenzhen) is located 9.4 km (5.8 mi) from Shenzhen North Railway Station and 1 km (0.6 mi) from Shenzhen Museum, while the Shenzhen Convention & Exhibition Center is merely 2.6 km (1.6 mi) away. Diners can enjoy eating at the Chinese restaurant specializing in Cantonese food as well as the Western restaurant. Room service is also an option. Those traveling on business can utilize the business center and meeting rooms while a currency exchange is also available. For recreation, guests can play tennis, basketball, golf, badminton, go to the gym, or take a dip in the outdoor swimming pool. To relax they can head to the spa, while those looking for a livelier time can partake in karaoke or go for a dance in the nightclub. 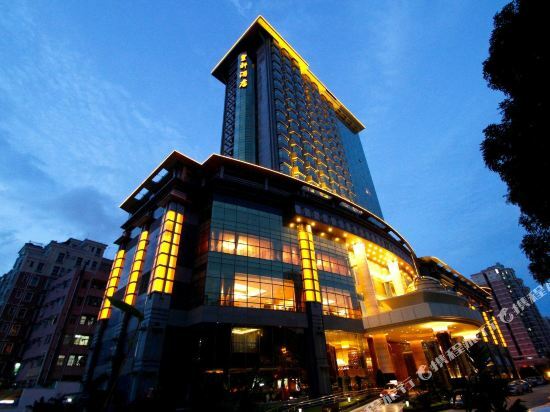 Free Wi-Fi in public areas and rooms as well as free parking are available at the Shenzhen hotel. 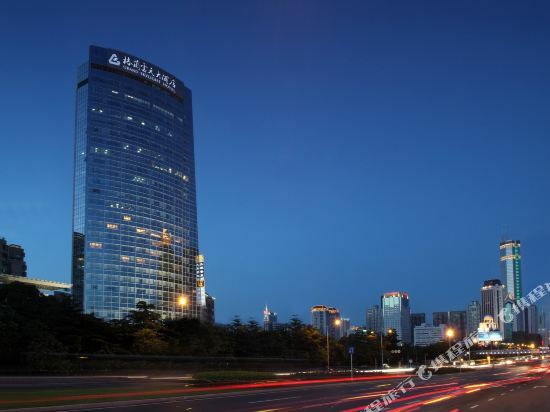 Shenzhen's Century Tower Hotel (Shenzhen Shentingyuan Jiudian Shijilou) is convenient to Luohu Train Station, Huanggang Port and Shenzhen Convention and Exhibition Center. Guests have plenty of activities to keep them busy with karaoke, tennis, massage, sauna and Spa all on premises. 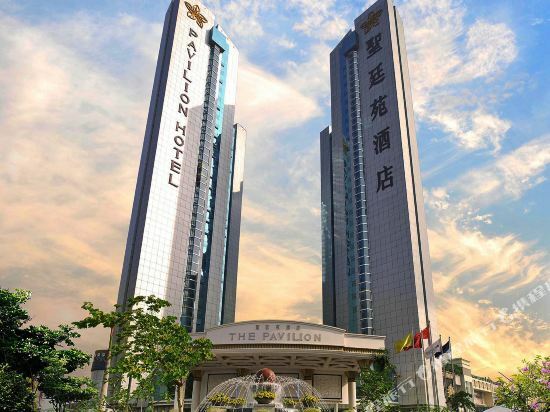 The&nbsp;Pavilion&nbsp;Hotel&nbsp;(Shenzhen&nbsp;Shengtingyuan&nbsp;Jiudian)&nbsp;grants&nbsp;guests&nbsp;easy&nbsp;access&nbsp;to&nbsp;Luohu&nbsp;Train&nbsp;Station,&nbsp;Huanggang&nbsp;Port&nbsp;and&nbsp;Shenzhen&nbsp;Convention&nbsp;and&nbsp;Exhibition&nbsp;Center.&nbsp;A&nbsp;30-minute&nbsp;drive&nbsp;takes&nbsp;guests&nbsp;to&nbsp;Shenzhen&nbsp;Bao'an&nbsp;Airport.Huaqiangbei&nbsp;Pedestrian&nbsp;Street&nbsp;is&nbsp;within&nbsp;walking&nbsp;distance. 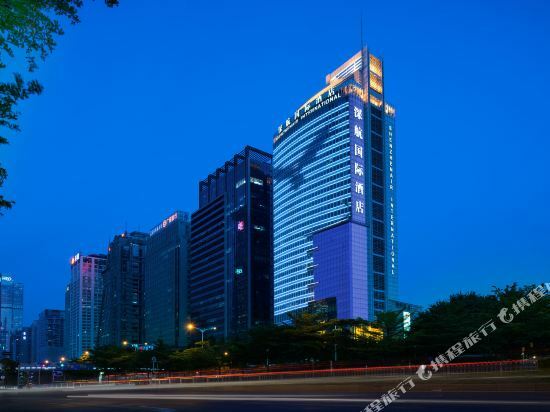 <br> <br>Rooms&nbsp;and&nbsp;suites&nbsp;in&nbsp;this&nbsp;Shenzhen&nbsp;business&nbsp;hotel&nbsp;come&nbsp;equipped&nbsp;with&nbsp;all&nbsp;the&nbsp;standard&nbsp;amenities. <br> <br>For&nbsp;meals,&nbsp;diners&nbsp;can&nbsp;enjoy&nbsp;well&nbsp;prepared&nbsp;dishes&nbsp;from&nbsp;around&nbsp;the&nbsp;world&nbsp;along&nbsp;with&nbsp;wine&nbsp;and&nbsp;cocktails&nbsp;at&nbsp;the&nbsp;Western&nbsp;restaurant&nbsp;and&nbsp;executive&nbsp;lounge.&nbsp; <br> <br>The&nbsp;meeting&nbsp;facilities,&nbsp;VIP&nbsp;reception&nbsp;hall&nbsp;and&nbsp;functional&nbsp;hall&nbsp;give&nbsp;business&nbsp;travelers&nbsp;a&nbsp;venue&nbsp;for&nbsp;various&nbsp;kinds&nbsp;of&nbsp;events&nbsp;or&nbsp;meetings. <br> <br>Free&nbsp;time&nbsp;can&nbsp;be&nbsp;spent&nbsp;swimming&nbsp;in&nbsp;the&nbsp;indoor&nbsp;pool,&nbsp;playing&nbsp;ping&nbsp;pong&nbsp;or&nbsp;tennis&nbsp;or&nbsp;simply&nbsp;lounging&nbsp;the&nbsp;steaming&nbsp;sauna&nbsp;or&nbsp;getting&nbsp;a&nbsp;massage. If you want to stay in the best hotel in Shenzhen, China, please come to Trip.com for a custom trip. Staying in exclusive Shenzhen Lotus Mountain Park hotel Trip.com offers, you can fully relax and enjoy the stay in Shenzhen and around Shenzhen. 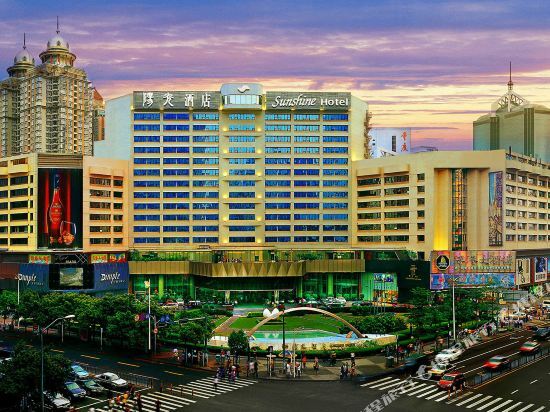 All these Shenzhen Lotus Mountain Park hotels lead in the industry in aspects of environment and recreation facilities, providing the best hotel service in Shenzhen. 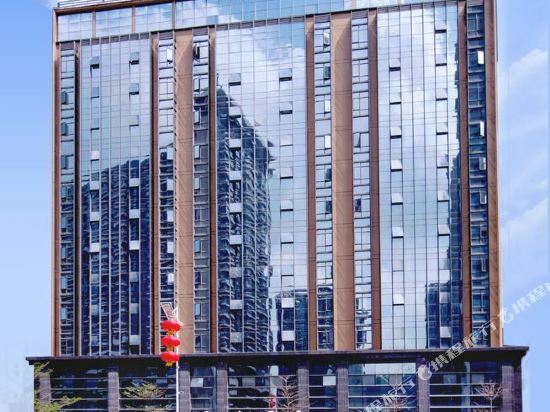 To ensure that you can find the latest Lotus Mountain Park hotel in Shenzhen, the latest hotel price as well as hotel facilities and indoor facilities information will be offered. In the meantime, detailed photos of Shenzhen Lotus Mountain Park hotel will be displayed, making you know quickly whether hotel’s interior environment meets your taste. Besides, you can know specific location and reviews on Shenzhen Lotus Mountain Park hotel from millions of users. If you want a nice room with limited budget, please filter through price and distance to get an appropriate Shenzhen Lotus Mountain Park hotel. To ensure you can experience the best Shenzhen Lotus Mountain Park hotel, users and we give a comprehensive rating on hotel, which gives useful help. Believe it or not, as the biggest online travel service company, we have the best service assurance and perfect users’ experience to meet your requirements in different aspects, no matter it’s Shenzhen hotel or Shenzhen Lotus Mountain Park hotel.